Watching birds from the comfort of your own home is for some people preferable to trekking out in the forest. The best way to attract birds of different colors and varieties is to create a paradise they will want to alight in. A bird feeder or two will draw some birds but it isn’t the most effective way to bring feathered friends to your property. Feeders can often attract other animals that aren’t friendly to birds. 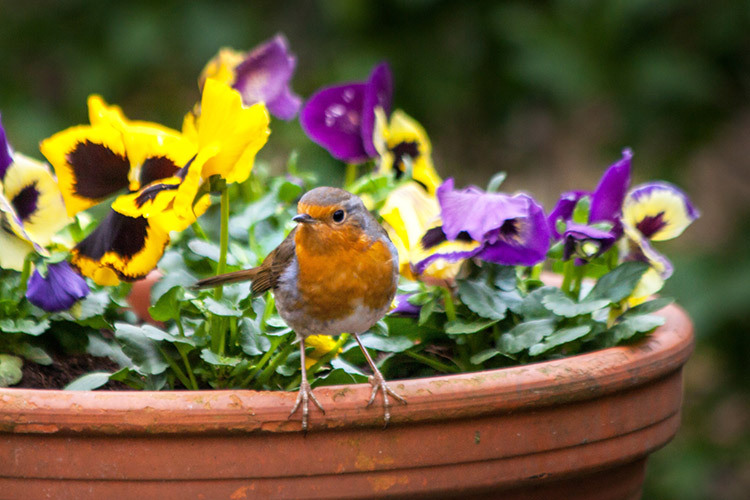 If the birds see these other animals in your garden, they may stay away out of self-preservation. Use high-quality seeds that are specifically cultivated for birds. Place the bird feeders away from windows to prevent flying accidents. The feeder should also be positioned in a way so that the bird can keep a look out for predators. The best place is somewhere high on a pole with no platforms that mammals can climb. A fountain of water not only makes your garden pretty but it also signals to birds that they’ve arrived at the avian Four Seasons. To ensure your bath is a five-star resort buy one that is exclusively manufactured for birds. It should be in an open area away from bushes that can hide predators. The basin should be wide and shallow rising at least three feet from the ground. Keeping the water pristine is a must. Birds sometimes drink or bathe in dirty water but they are attracted to clean water. Birds like trees and shrubs that are colorful, leafy, or bear fruit. High boughs where they can build their nests is also pleasing to them. They like trees such as dogwood, red cedar, and oak. All trees are great but those that provide shelter and food are the best. Planting vines such as honeysuckle and Virginia creeper provide some privacy for them. In winter the Virginia creeper will bear fruit which is an important food source for them in the colder months. Take care not to eat the berries of the Virginia creeper – they are toxic to humans. The milkweed is a flowering plant that is lovely to look at and is also an important food source for insects and monarch butterfly caterpillars. Birds will come just to feast on the tiny critters that the milkweed plant attracts. These bright, gorgeous flowers have a secondary function for birds. They bring forth seeds giving migrating birds the sustenance they need to make long journeys. Hummingbirds like this tubular shaped flower – a perfect cup of nectar for the tiny fluttering birds to drink out of. If you’re looking to attract more hummingbirds, they also love fruit such as cactus pears and oranges. Another reason why a bird might want to stay in your garden is to start a family. The requirements for this include a safe, clean home with plenty of food. The nest boxes have high property value among avian. With rapidly declining untouched areas natural nesting holes have become scarcer. To help a homeless bird try putting up some pretty nest boxes in your yard. Some can be nailed to trees. Others have tall posts and are dug into the ground. Whichever your preference, the nest box is an invitation for a bird to stay awhile. Which Pet Reptile Is Right for Me? Am I Ready to Adopt a Cat?